In two and a half weeks from now, Brazilian voters will go to the voting booth and elect their favorite candidate for president. From the looks of it, Mr. Jair Bolsonaro is sailing towards an easy victory in the first round. He also seems to have gotten both the markets and international investors on his side because, although today’s European version of the Financial Times once again discusses the contradictions in previous stories about him, the title shift on the front page is quite obvious. Before, all European newspapers would talk of the ‘far-right’ candidate. 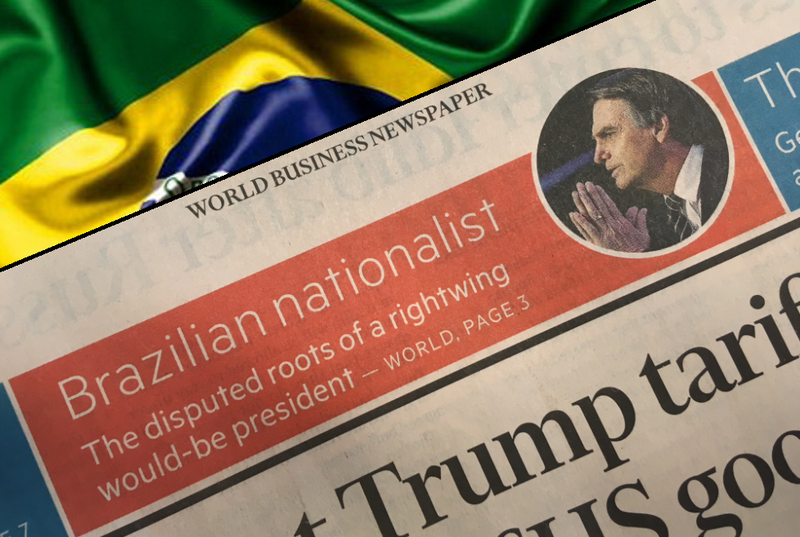 Now that Mr. Bolsonaro is continuing to ride high in the polls and no one wants to be seen criticizing a candidate who barely survived an assassination attempt, this becomes a ‘nationalist right-wing’ candidate and even a ‘would-be president’. Markets and investors understand of course very well how a two-round presidential election works. Backing two economically favorable candidates (in this case the rightwing Mr. Bolsonaro and the more center-right Mr. Geraldo Alckmin) who both want to reform Brazil’s spending habit and put it in line with what investors are looking for can leave you without a candidate in the second round. As investors agree that the Brazilian electorate will probably end up with Mr. Fernando Haddad (the replacement of the jailed former President Lula da Silva) on the left and Mr. Bolsonaro (who now holds an insurmountable lead for the first round) on the right for that second round end of October, international business newspapers have relaxed their opinions on the former army captain. The Datafolha poll that this week showed his popularity to have risen to 26 percent from 24 percent (some even say 30 percent), nearly twice as high as his nearest competitors, leftists Ciro Gomes and Fernando Haddad, in the two-round election, was the final straw. Meanwhile, voters are clearly flocking to Mr. Bolsonaro for his promise to restore order and change a broken system. They are more than willing to forgive any previous comments about gays or women as long as they can get rid of the crime and corruption. It would appear European investors are starting to agree.